This blog is in response to a specific enquiry from someone on one of our recent Excel Power BI training courses, but it may well be of general interest! Events happening for a given "app" (whatever that may be) on given dates. This example is relevant for any process which goes through a series of stages (whether this be patient flow in a hospital, product review or - as for the client in this example - financial authorisation). 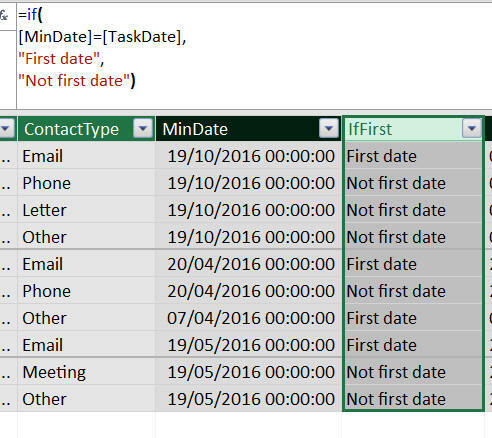 You want to show how many events occurred on the first and/or last date for each contact type. 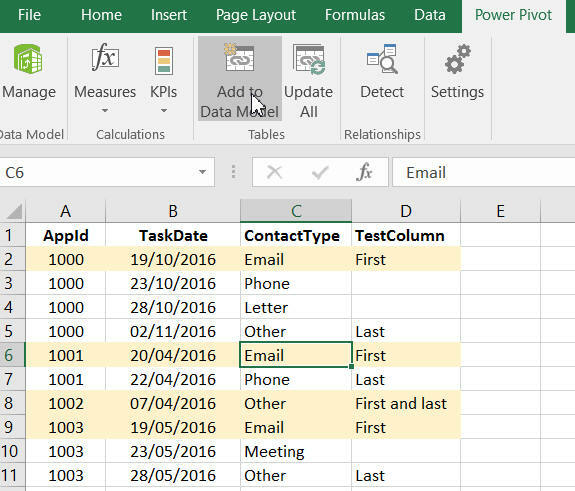 Choose the Power Pivot tab, then the Add to Data Model icon (if you don't have this tab visible, you need to step back a bit). Your table does have headers, so tick the box and select OK. The table in your model should look something like this. The formula works out the minimum of the dates for each app (and is explained below). What this does for any row is to take a subset of the entire table, picking out only those rows where the app id equals the one for this row. The EARLIER function is surely the most confusing in DAX, and is explained in more detail in this blog. 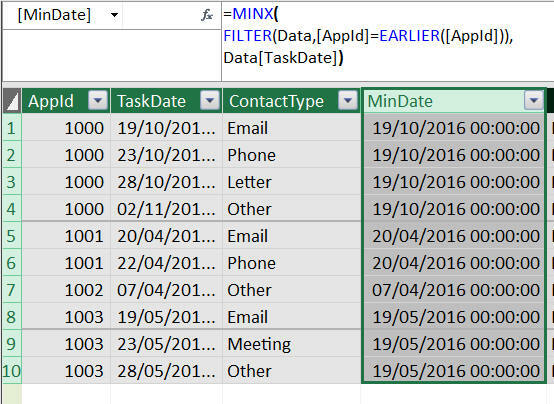 The formula returns First date for each row if (and only if) the date equals the minimum date for this app id. Choose to create a pivot table like this. Note that I've also created MaxDate and IfLast columns in the data model, using the same technique. 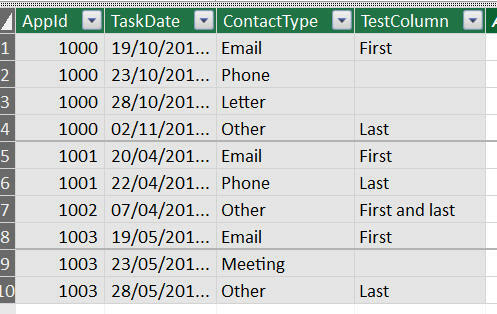 Here we're showing the number of rows for each contact type, with the IfFirst column as a filter. You can then apply a filter to show the first date data! Click on the symbol shown to show only data for the first date.